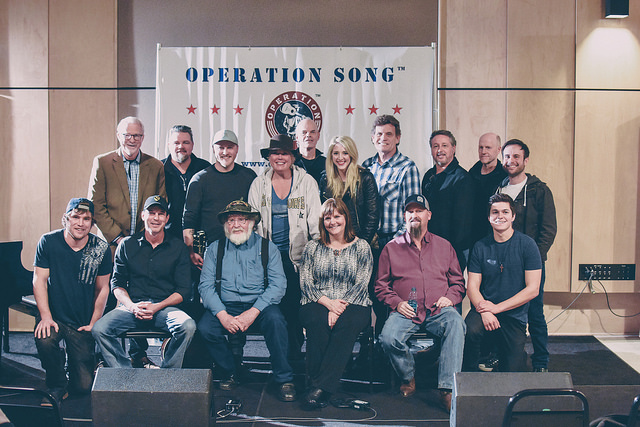 In the winter of 2016, professional songwriters, Belmont songwriting students, a group of military veterans and representatives from Operation Song and the Nashville Songwriters Hall of Fame met to provide an opportunity to serve veterans through song. The team met at the Curb College’s first Operation Song writers retreat held at Belmont University at the Music Row songwriting facilities. At the end of the day, the group gathered in historic Columbia Studio A for a writers’ round where the newly crafted songs were debuted. Founder and CEO of Operation Song Bob Regan, Executive Director of NSHoF Mark Ford, Carol Anne Ford, Belmont Songwriting Chair James Elliott, Director of Development and Industry Relations Sarah Cates and Coordinator of Sound Reinforcement and Live Events Lucas Boto organized the inaugural event. The effort has continued on campus and the second event was held this fall with representatives Mike Porter, James Elliott and Kim Powell serving as lead for Belmont. Watch this video to hear about the moving experience from both the student writers and veterans.